BPSSC Steno ASI Results 2018: Bihar Police Department is ahead to conduct the Steno Assistant Sub-Inspector Examination on 26th August. 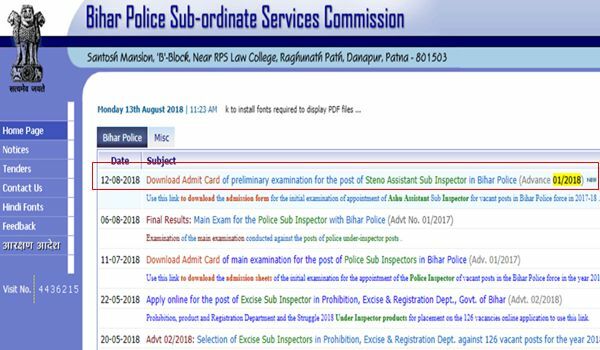 Bihar Police Sub-ordinate Services Commission (BPSSC) will organize the Steno Assistant Sub-inspector examination on behalf of Bihar Police Department. The written test will be conducted in various examination centers across the Bihar state. Many of the hopefuls are expected to compete for the examination this year. BPSSC is going to organize this examination with proper care and strict supervision. Candidates those who appeared for the BPSSC Sub-Inspector examination will have to download BPSSC Steno ASI Results from the official website today, bpssc.bih.nic.in. Bihar Police Department works for the state level safety and security. The department hires the suitable candidates into various designations based on the requirement. Every year the Bihar Sub-ordinate Services recruits the suitable candidates for various designations base don the requirement. The BPSSC has announced the 174 Steno Assistant Sub-Inspector posts. Many of the suitable aspirants have applied for the Steno Assistant Sub-inspector posts during the application dates. The organization is going to shortlist the suitable candidates through various rounds of selection process including the written test, medical examination, physical standards test, interview round, and other selection criteria. Applicants have to go through the written test round initially in the month of August. The Bihar Police Department has scheduled the SI written test in the months of August/September. Candidates applied for the SI posts have to attend the written test as per the schedule. Initially, candidates need to download BPSSC Steno Assistant Sub-inspector admit card 2018 to attend the test. Results have been released on 6th September. On the homepage, click on Bihar Steno Assistant Sub-Inspector Final results of preliminary test 2018. Take a printout and save it for future.